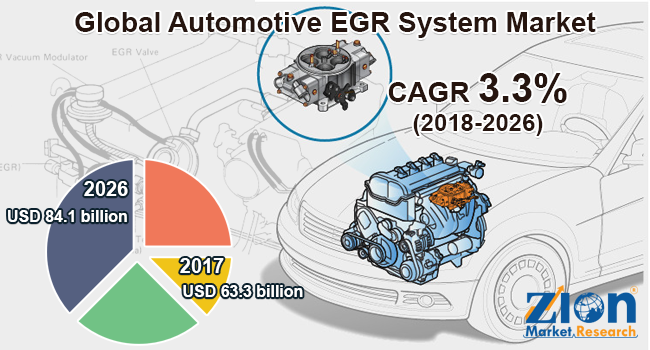 Global automotive EGR system market expected to reach USD 84.1 billion globally by 2026, with a CAGR of around 3.3% between 2018 and 2026. Automotive exhaust gas recirculation system (EGR) helps in reducing NOx emissions in internal combustion engines. The report covers forecast and analysis for the automotive EGR system market on a global and regional level. The study provides historical data for 2016 and 2017 along with a forecast from 2018 to 2026 based on revenue (USD Billion). The study includes the drivers and restraints for the automotive EGR system market along with the impact they have on the demand over the forecast period. Additionally, the report includes the study of opportunities available in the automotive EGR system market on a global level. This report offers a comprehensive analysis of the global automotive EGR system market along with, market trends, drivers, and restraints of the automotive EGR system market. This report includes a detailed competitive scenario and product portfolio of the key vendors. To understand the competitive landscape in the market, an analysis of Porter’s Five Forces model for the market has also been included. The study encompasses a market attractiveness analysis, wherein all the segments are benchmarked based on their market size, growth rate, and general attractiveness. This report is prepared using data sourced from in-house databases and secondary and primary research teams of industry experts. The study provides a decisive view of the automotive EGR system market by segmenting the market based on product, vehicle, application, and region. All the segments have been analyzed based on present and future trends and the market is estimated from 2018 to 2026. Based on the product, the segmentation of the automotive EGR system market includes a valve, cooler, and pipe. Based on the vehicle, the segmentation of automotive EGR system market includes passenger cars, light commercial vehicle, and heavy commercial vehicle. Based on application, the segmentation of automotive EGR system market includes diesel powered and gasoline powered. The regional segmentation includes the current and forecast demand for North America, Europe, Asia Pacific, Latin America, and the Middle East and Africa. Each region has been further segmented into the U.S., Canada, Mexico, the UK, France, Germany, Spain, Italy, China, India, Japan, South-East Asia, Brazil, Argentina, GCC countries, and Southern Africa. The report covers a detailed competitive outlook including the market share and company profiles of the key participants operating in the global automotive EGR system market, such as Mitsubishi Electric Corporation, Continental AG, IAV, Friedrich Boysen GmbH & Co. KG, Denso Corporation, Delphi Auto Parts, ElringKlinger AG, Knorr-Bremse AG, Lucas Electrical, MAHLE GmbH, NGK Spark Plug Co., Ltd., BorgWarner Inc., Hitachi Ltd., Eberspacher Group, and Johnson Electric Holdings Ltd., among others.